Preet Bharara, the former U.S. attorney for the Southern District of New York, explained in an interview Sunday with CBS's "Face the Nation" why he thinks his old office might be a bigger threat to President Donald Trump than special counsel Robert Mueller is. Promoting his new book, "Doing Justice," Bharara sad that Manhattan federal prosecutors are unencumbered by the restraints put on Mueller, saying the office "doesn't have the same circumscription on its ambit that the special counsel does." It was investigators in the Southern District of New York who prosecuted Trump's former longtime attorney Michael Cohen for a litany of crimes — including a pair of campaign-finance violations for hush payments he says he made to two women at Trump's direction shortly before the 2016 election to keep them from talking about alleged affairs with the then-presidential candidate. Trump has denied having any affairs. The office is currently probing the Trump Organization and Trump's inaugural committee, and Cohen said in public testimony on Capitol Hill last month that he was still providing those prosecutors with assistance in their various investigations. 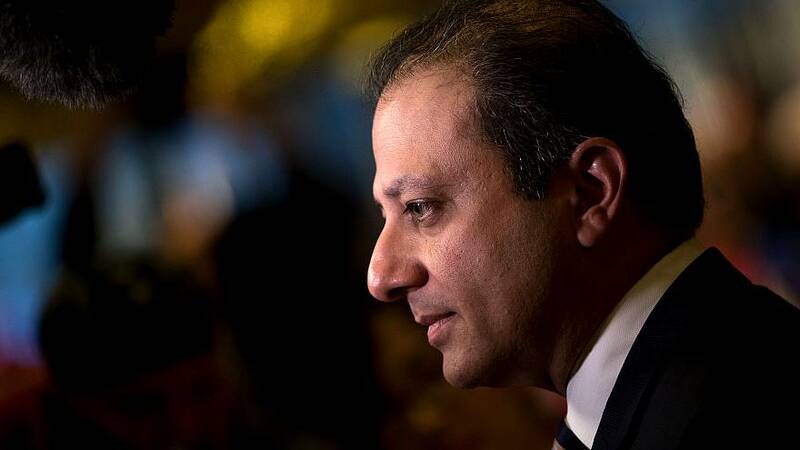 Bharara, who was fired along with dozens of U.S. attorneys near the start of Trump's term despite the president earlier telling him he could stay in his position, also defended his office from Republican criticism surrounding its Trump-related investigations. Last week, Republican National Committee Chairwoman Ronna McDaniel tweeted that the latest SDNY probe was an "example of blue-state liberal prosecutors carrying out their vendetta against" Trump. "The Southern District of New York has a lot of people in it whose mission is only to find crime, be able to prove it beyond a reasonable doubt if it's in the interest of justice to do it, and they're very aggressive, and they're very fearless and they're very independent," Bharara said. "They don't care about politics. When I was there, we prosecuted Democrats and Republicans and it didn't matter who they were affiliated with." Former New Jersey Gov. Chris Christie, a Republican former federal prosecutor, told ABC News during Cohen's hearing before the House Oversight Committee late last month that Cohen's cooperation with the office "would send a chill up my spine" if he worked at the White House. Last month, The New York Times reported that late last year, Trump asked then-acting Attorney General Matthew Whitaker whether Geoffrey Berman, the Trump-appointed U.S. attorney in Manhattan, could be put back in charge of the investigations involving Cohen. Berman recused himself from those probes. Although there was no indication Whitaker did anything as a result of Trump's request, Whitaker told colleagues that Berman's office needed "adult supervision," The Times reported.